My sculptures and installations enact the places where culture and social norms influence the ways we navigate and perform intimacy. They range from objects to installational sculptures that are augmented by the viewers performance. These performative installations imply the body or its placement and ask the viewer to physically interact with them. 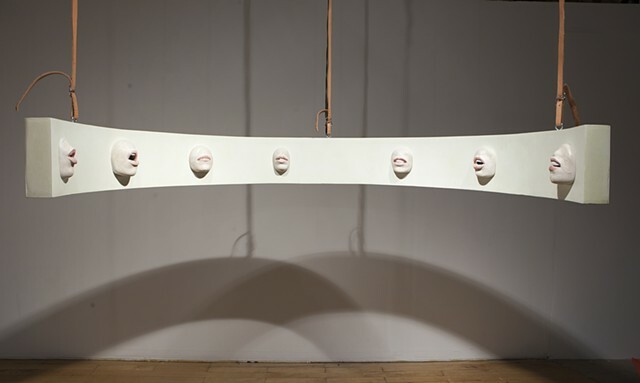 In this work the viewer becomes a graphic part of the sculpture while also having a unique and personal experience of it. Both types of work stem from a framing of resonant gestures that ritualize and familiarize psychological narratives and personal memories. These sculptures consider social feedback loops, popular narratives of desire, as well as mythology and nostalgia and the fetishism that both imply. Gesture is the fulcrum around which this work revolves. I am influenced by Lygia Clarks Sensorial and Relational Objects which use ritualized and focused gestural performances to reframe the processing of memories, inter-personal interactions, and conceptions of self. I use four methods that reference gesture to engage the viewers bodily attention: representation, enactment, interaction, and responsiveness. By repeating and reframing iconic gestures these works find new ways of representing and experiencing the ephemeral psychological and spatial dynamics of interacting with others. They seduce through materials and form, prompt consideration through user experience and sensorial awareness, and create, as Nigel Thrift says, new and more productive entanglements by activating sticky and paradoxical spaces of negotiation.